HOW TO HIT THE ROAD AND THEN WHAT? There may come a time in your life when you have to make a change to find your freedom. That day came for me after losing my partner for life, a wonderful husband to the medical horror of Agent Orange. My relatives became skeptical then critics. But life is short, the choice is ultimately up to you, not them. Definitely not something my Aunt Mary would do. "If you sell your house, where are you going to live?" Pointing to my new home parked in the driveway, a 26-foot Jazz fifth wheel RV along with the newly rebuilt modified 3/4 ton truck that was once my husband's, I thought she was going to faint. But I felt my guy was standing there with me giving me his slight nod of approval in making use of the resources around me. The mechanical work was paid from the estate sale funds. "Good," he would say. "No truck payments. You're going to be just fine." And as our dire economy has plodded on, it took three years to sell that home, allowing me time to get used to being a Full Time RVer. Having to stay in the area until our home did sell, I returned to nursing in the home health care venue in South Texas. Today I have no regrets, our home had become too much to care for physically and financially for one person. I could no longer continue to work three jobs to support an over mortgaged, over taxed home. If you think I'm looking for sympathy then forget it because change can be like a cool breeze on a hot summer day, since I also decided it was time for a career change. Our American medical scene was vastly changing, almost like something terrible lurking on the horizon. Looking back on how many of the doctors and nurses I worked with, prior to the Affordable Care Act, who had lost their jobs or practices, unable to keep their clinics open, I made the right choice. Every new RVer has another choice to make. Before selling your home, what are you going to do with your STUFF! These are the stuff choices: I could keep only what would comfortably fit in my truck and trailer. Since my truck has to not only tow the trailer up inclines it also has to be able to stop the trailer, this means no overloading. Thus...take only what I would absolutely need. The tough decision was that the rest had to go. If I don't want to pay monthly storage fees then I was left with the other choices of donating to thrift shops or maybe a relative would want it. The rest was sold in the estate sale. My life was then downsized and simplified, no longer a slave to stuff. As you can see in the photo above, my base camp is easy to care for, a gravel lot with a simple casita or little house another name for a storage shed. Looking back on those days I can say, "This is all I need." As the sun sinks below the Pecos River Bluffs and you have gathered around my virtual campfire, I have miles and miles under my belt from traveling America's highways and byways. 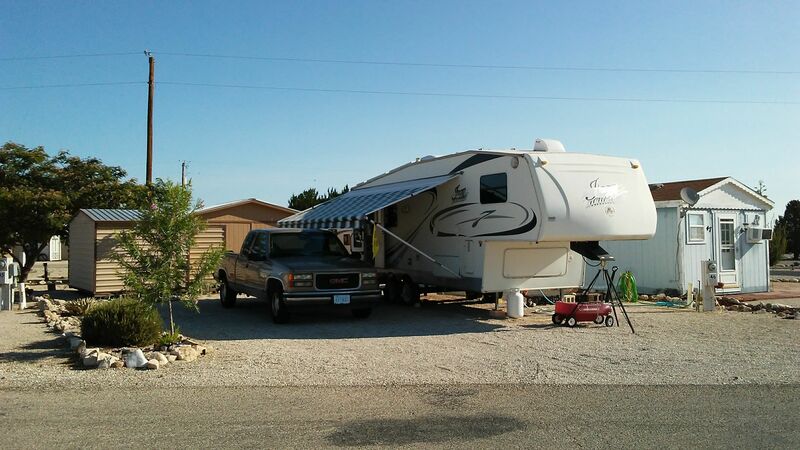 There are so many different wonderful full time RVers out here from single campers to families. Today I am known as a Lady L.O.W. or a Loner On Wheels. We travel together in groups or caravans or on our own to weekend camp outs held by L.O.W. chapters, go to larger event rallies or different parks, even the main headquarters of the Low-Hi RV Ranch in Deming, New Mexico. Our demographics are made up of mostly retired, but those of us who work are on the increase. We can be simple as working campers for the park where we chock our wheels, earning our RV site with utilities and/or pay, or working from our rigs. Your possibilities could also depend on your mobile Internet connection. A wider range of full timer choices can also be found with the Escapee camping club known as the Escapees. If you want to travel, find a home base, find employment, or just learn more about the RV lifestyle their link is in the resource list below. There is something for everyone, even a huge rally called an Escapade. How and where you create your income is up to you, so why not travel at first with your career and talent. I have met traveling medical personnel, local school educators, oil and gas workers, a culinary team who could run an entire restaurant, and full timers who trained to become mobile RV repair technicians. On occasion I have come upon writers, reporters, even programmers with their home-schooled children. And for those of you with kids, one of my Escapee SKP Park neighbors out here in the desert country of New Mexico recently celebrated a great accomplishment. They had hit the road along with their youngest son who was home schooled, and now at eighteen he will be going on to graduate school. Not to get long winded, I could tell you so much more. Yet, as you can see the choice is really up to you. The possibilities are endless. The road awaits. @roadscribe As a full-time RVer myself, I think this is great information for anyone considering this lifestyle. I'm looking forward to more of your posts! Upvoted and resteemed. I was just talking about this today!! Great read!